Here you can find a strain description about Blue Tahoe Cheese and also some user-based reviews and infos directly from the SeedFinder (if available). 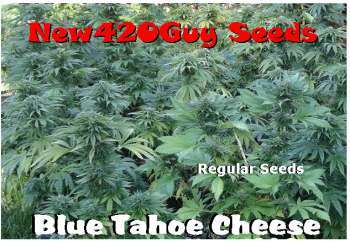 You can also find the offers and auctions here if Blue Tahoe Cheese cannabis seeds are on stock at MyCannapot right now. Blue Tahoe Cheese (Blue Tahoe x Blue Cheese) is another stinky and very potent indica dominant hybrid F4 strain (80% indica / 20% sativa) )that does very well inside and outside, producing lots of large fat very dense buds loaded with frosty goodness and a loud fragrance. We see two different pheno types here, but most will have a strong aroma of Tahoe OG mixed with Cheese; some have a strong blueberry smell. Good for depression, pain, insomnia, nausea or stress. Also good for PTSD. You can expect very high THC content in the new F4s! Flowering period is 8-9 weeks. Buy Blue Tahoe Cheese now at MyCannapot!